At Virtue Dental Care, our entire team is committed to providing patients near Roanoke, VA and the surrounding areas with high quality dental care in a technologically advanced practice. When patients come to us in need of dental restorations, we often recommend solutions using CEREC technology. CEREC allows us to fabricate dental crowns, inlays, and onlays in one day, giving patients the benefit of a fully restored smile in a single appointment. Dr. Virtue and the rest of the team is committed to using CEREC and other advanced dental techniques to ensure patients have access to the most up to date solutions for achieving a beautiful, healthy smile. CEREC stands for Chairside Economical Restoration of Esthetic Ceramics. What this really means is that CEREC is an advanced CAD/CAM system that allows us to fabricate certain restorations in a single visit. In the past, restorations such as crowns, inlays, and onlays all required multiple visits to the dentist and a wait of several weeks. Now, patients can come into our office and have their restoration made while they wait. 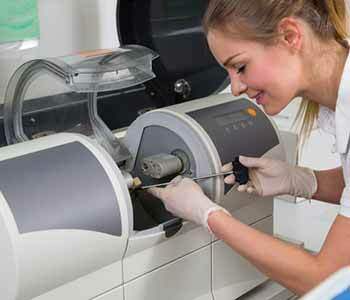 The best part is that CEREC restorations are just as durable, long-lasting, and natural-looking as those that are fabricated at an off-site laboratory. Dental crowns are protective coverings, or caps, that are placed over the entire visible structure of the tooth. Crowns can be used in a variety of situations, most commonly when a tooth has been compromised due to severe decay or injury. Dental crowns protect these weakened tooth structures to restore the ability to bite and chew, and to prevent further breakage. Dental crowns are also commonly used when a dental implant is chosen to replace a missing tooth, or as part of a dental bridge to replace multiple missing teeth. Dental crowns are versatile restorations that look and feel like natural teeth. Dental bridges are a type of restoration used to replace multiple missing teeth in a row. Dental crowns are placed on teeth adjacent to the gap with artificial teeth between the crowns to fill the gap. One of the cornerstones of our practice is offering safe, conservative dental care. Inlays and onlays are special types of restorations that can be used when a tooth is too damaged for a simple filling but doesn’t necessarily require an entire dental crown. Inlays – Inlays are used when there is damage to the surface of the tooth, typically when there is decay between the cusps. Onlays – Onlays are used to cover a larger area of the tooth. Sometimes referred to as partial crowns, onlays are placed on the biting surface and extends to one or more cusps of the tooth. Precision – CEREC restorations are made from digital impressions that are extremely accurate, providing patients with a precise restoration that fits comfortably. This also means that patients do not have to deal with messy molds or impressions. Efficient – CEREC restorations are designed and fabricated in a single appointment. This eliminates the need to place a temporary restoration while the patient waits weeks for the final solution. Natural-looking – During the CEREC process, we can match the restoration to the color of the existing teeth to ensure that they blend in seamlessly with the rest of the smile. Durable – CEREC crowns that are fabricated in our office are just as strong as crowns that are made at outside laboratories. The team at Virtue Dental Care is eager and ready to share with you the many benefits of CEREC crowns, inlays and onlays. By providing you with a restored smile in just a single visit, we’re able to minimize the impact of dental restorations on your time and daily life. If you would like to learn more about CEREC restorations, or any of the other services that we offer patients near the Roanoke, VA area, please call us today at 336-606-0040 to schedule your consultation.